How does this sound for a tempting combination....100mph performance, 70mpg economy from a 500cc water cooled, fuel injected engine, controlled by a fly by wire throttle and kept in check with traction control and ABS. You don't have even have to change gear! Just jump on, twist the throttle and the speed just keeps building. Throw in good levels of comfort and weather protection, somewhere to stow your riding gear and here is the killer, you don't even need a full bike licence to ride it! 'How so?' I hear you cry....'it's a 500cc machine!". 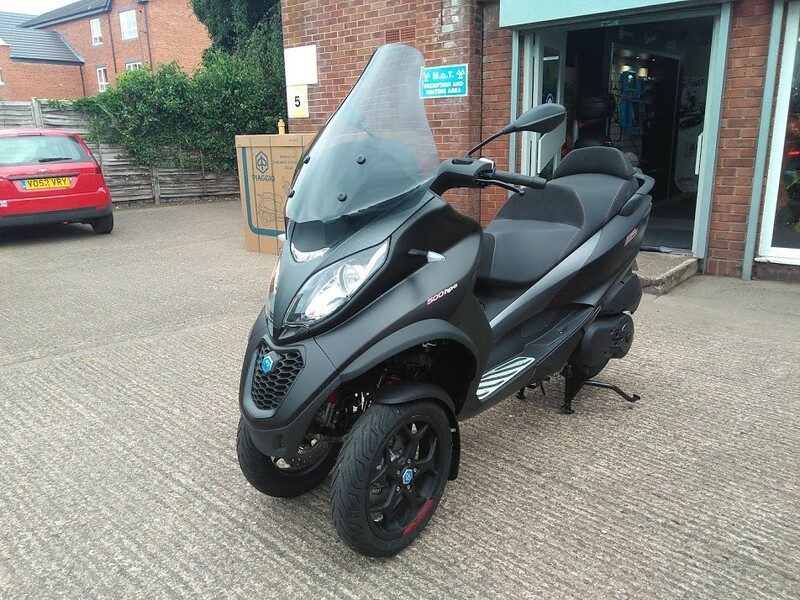 Well this bike is actually trike and has its two wheels at the front, spaced in such a way as to allow the Piaggio MP3 500HPE to be classed as a 'Tricycle', just like a Can-Am Spyder! So you ride this 100mph bike on a car licence! Not only do you get all this but when you pull up at junction you don't even have to put your feet down and risk marking your handmade leather brogues (its a posh bike and should be ridden suitably attired)...just hit a button on the bars and the MP3 will diligently stand upright without your assistance! How cool is that?! This unique trick is enabled by the complex and very clever front suspension set up that tilts the dual wheels are you take a bend but also allows the legs to be locked when needed at rest. 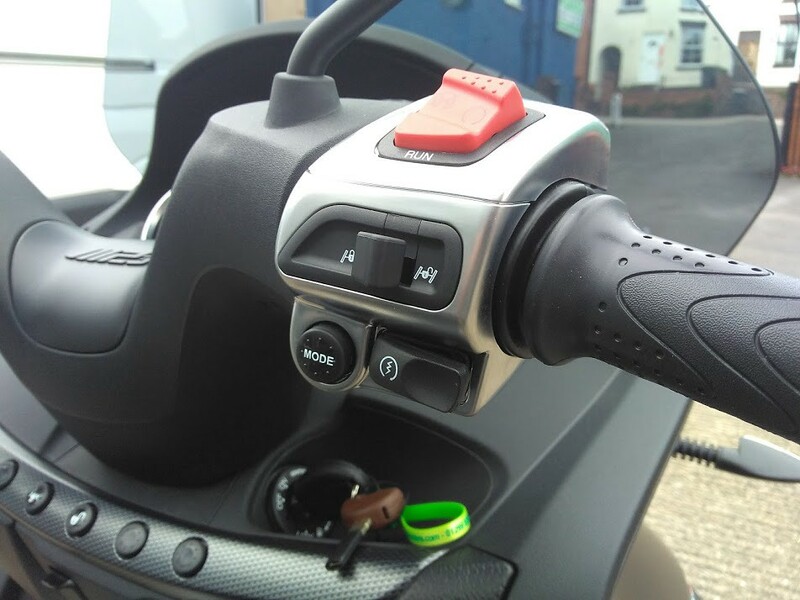 It even has a park brake you can engage so if you pull up on a gradient there is no problem. But this is not new, The MP3 has been on sale in various guises since 2006, but this is my first opportunity to try one. I thought as this is the scooter for the bigger journey what better first test than to hit a dual carriageway and see how it performed given a little room. The answer is pretty well...you sit in a comfortable, almost formal posture and just let the MP3 take the strain. The example I rode was literally brand new and apart from the technician that had assembled and PDi'd it I was the first person to ride it. Nonetheless we were soon sweeping along the A449 at indicated 70mph. The engine did feel a little tight, but the single cylinder 493cc 44bhp unit pushed us along willingly. The twin front wheels track the big sweeping bends on that road faithfully, the complex set up, allows the two wheels 'lean' in unison. Similar to a Yamaha Tricity I rode a couple of years ago, but the whole bike feels way more substantial that the little Yamaha. The big dual carriageway test passed with some aplomb it was time to give it the beans in the twisties. The route from the outskirts of Worcester to Droitwich is a great little piece of typical English B road and it was fun to hassle the big Piaggio along. Don't get me wrong it's no Ducati, but you can go along at a surprising good lick! 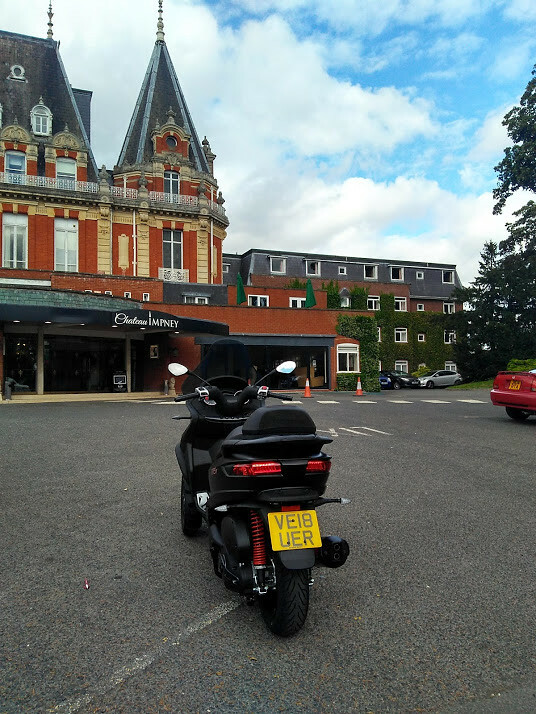 I decided that such a imposing scooter needed a suitably imposing location to take some pictures...Chateau Impney it is. 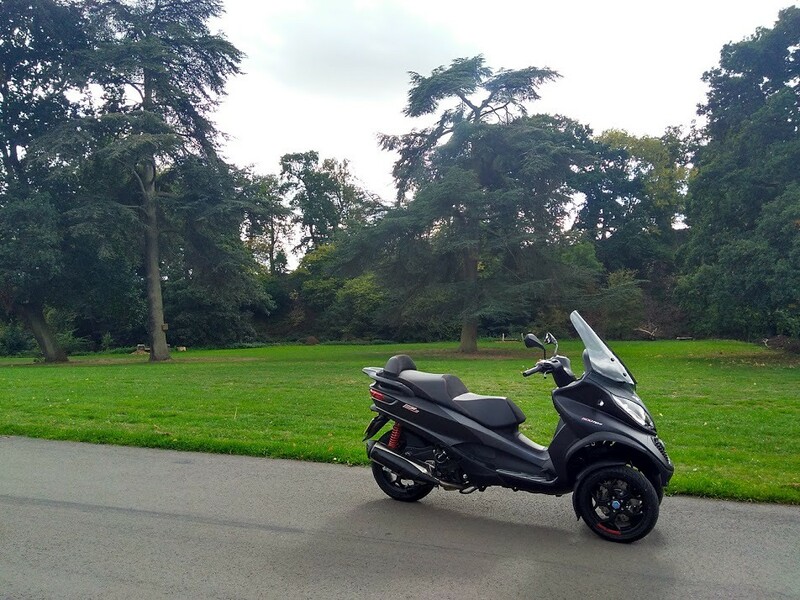 An amazing piece of France in the West Midlands, a juxtaposition much in the way a 100 mph scooter is! Finally it was time to see if the big Piaggio share the traffic slicing talents of its' smaller siblings, and I please to report it. In fact it can hustle with some panache and made short work of the traffic in and around my local ring road. This is a machine where you almost feel you should be suited and booted to ride, as you sweep to work at the office. 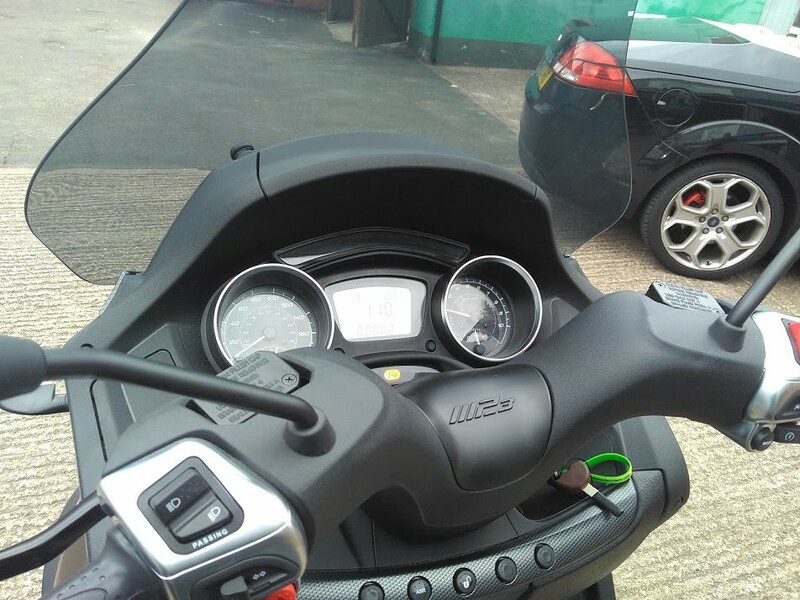 The delicacy that is so typical of many Italian machines is replaced here, by an assertive almost Germanic stance, a vibe enhanced by the black finish of the bike and the carbon fibre accents on this HPE variant. 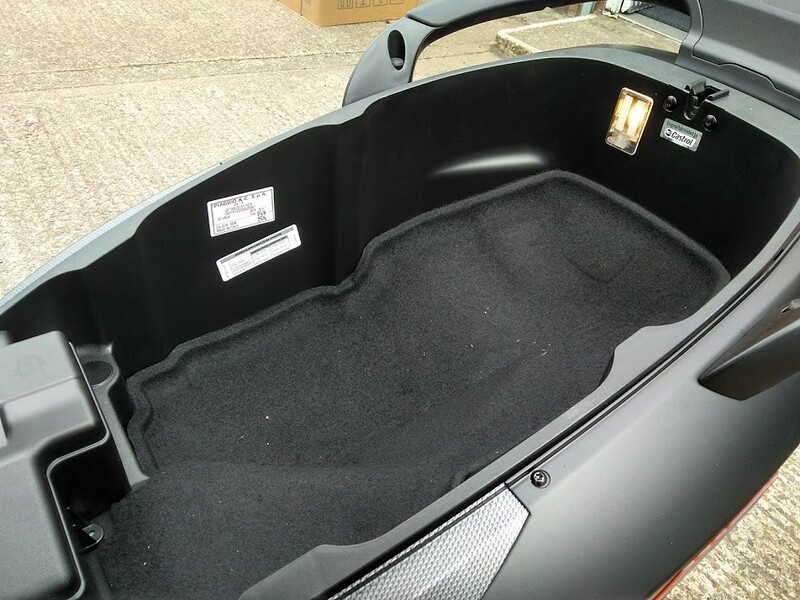 It makes a lot of sense too; 70mpg a Euro 4 compliant engine and a huge amount of under seat storage. At £8800 it is not cheap, but this is a well made, well proven piece of kit. Thanks to the lads at Readspeed for the loan of the demo bike, give them a ring if you fancy a go too! 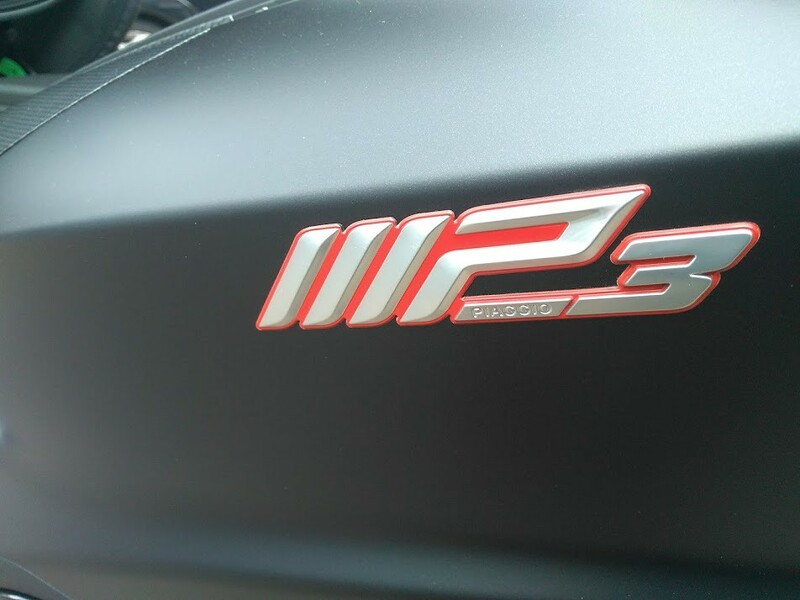 Re: Piaggio MP3 500 HP - Tre sono meglio di due? Nice write up as always Don. I kinda like the idea of the big cc scooters, but 3 wheels is one to many for me!